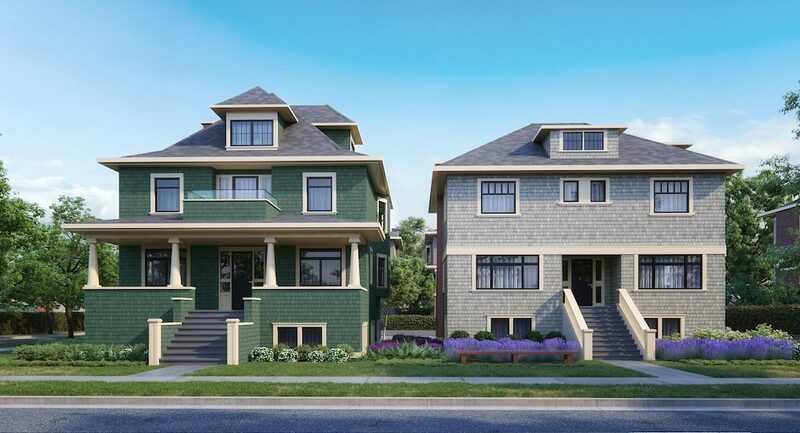 Campbell Residences, a collection of eight luxurious townhomes, is now previewing in Vancouver’s sought-after Cambie Village. The boutique townhome community by South Street Development Group seamlessly integrates heritage preservation with new construction to create a truly unique homeownership experience. Offering a piece of history in the heart of the city, Campbell Residences includes the revitalization of the Annie Campbell House and the Henry and Idella Campbell House. Designed by Birmingham and Wood Architects and Planners, the townhomes perfectly balance past and present with tasteful placement of three new construction townhomes along side the heritage homes, with extensive landscaping creating a lush and an inviting courtyard . The sophisticated architecture is distinct, yet, reflective of the heritage era, paying respect to the history of the neighbourhood. Designed by I.D. Lab Inc., the charming homes feature over-height ceilings and brushed oak engineered hardwood flooring. For a bright feel, the homes include a warm and neutral colour palette, with ample skylights and LED pot lights throughout. Perfect for entertaining, the classic kitchens are outfitted with polished white quartz countertops, full-height pull-out pantries and an oversized tile full-height backsplash. Kitchens also boast premium, fully-integrated Liebherr and Miele appliance packages. Residents can unwind in the lavish bathrooms where high-quality finishes are standard in all homes. The bathrooms boast deep soaker tubs, glass showers, sleek grey engineered stone countertops and a floating vanity. Located in vibrant Cambie Village, Campbell Residences has a WalkScore of 95, allowing residents to travel almost anywhere on foot. The bustling neighbourhood features a wide array of historic sites, cafes, restaurants and speciality shops. Light-rail rapid transit is also nearby, along with a plethora of bike lanes and bike and car share programs. To learn more, register here for the latest details. For more information call 604 398 3397, email heritage@liveatcambievillage.com or visit liveatcambievillage.com.